Putnam Service Dogs is recognized by the IRS as a 501(c)3 corporation. 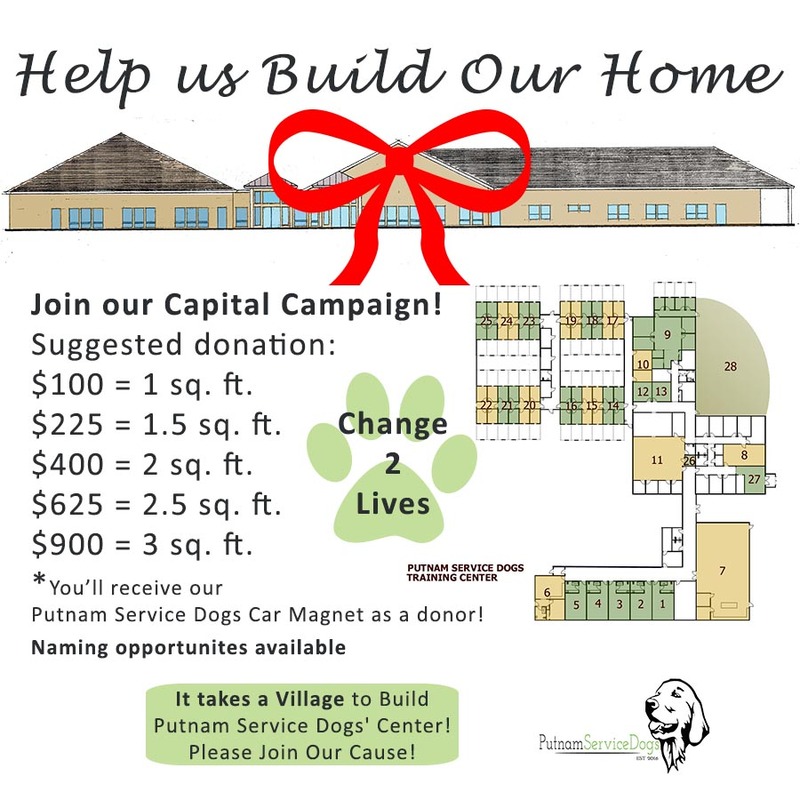 Putnam Service Dogs has the design for a state of the art Center., which can be build in phases as funds allow. We need at least 10 acres for our site. When the Center is fully completed, it will be approximately 30,000 sq ft., will kennel up to 144 dogs in large kennels with outdoor runs. The dogs will be separated into rooms of no more than eight dogs, each with an independent ventilation system to minimize the spread of disease among the dog population. There will be radiant floor heating throughout the Center for the dogs’ comfort in the cooler months. The 10 handicap accessible dorm rooms for our recipients and their families will contain homey furniture, with a nearby laundry room for their convenience. A caretaker will live in an adjoining apartment, available to assist them if needed. There will be a large dining hall, with a kitchen, and an exercise room/lounge for our guests. The training areas are nearby where our trainers will work with the recipients, teaching them how to work with their Service Dog and fine tuning the skills of the dog to suit them. There will be solar panels on the roof to provide supplemental electricity. The building will be insulated, with energy rated windows, to maximize energy efficiency. Rain water off the roof will be captured and used to water the landscaping in the front of the Center. There will be numerous fenced, large areas for the dogs’ exercise and play. Each Named Area will display an Acknowledging Plaque – Can be paid in installments.